Hypocenter depth recalculated from 543.0 to 547.0 km. Hypocenter depth recalculated from 547.0 to 546.0 km. Hypocenter depth recalculated from 546.0 to 543.0 km. Hypocenter depth recalculated from 543.0 to 541.0 km. 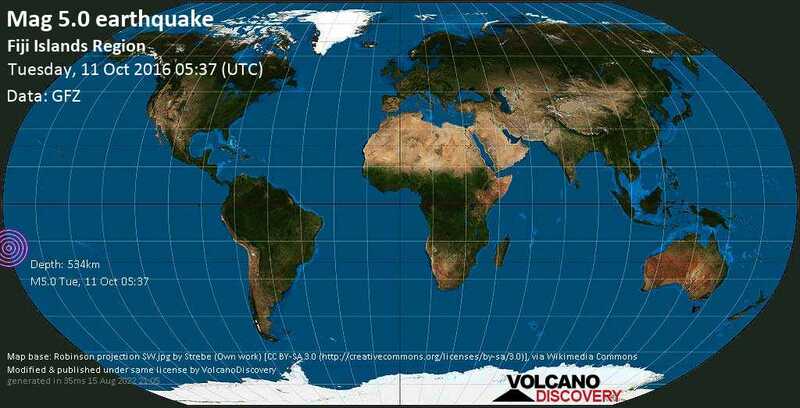 Oct 11 05:51: Magnitude recalculated from 4.9 to 5.0. Hypocenter depth recalculated from 540.0 to 539.0 km. Hypocenter depth recalculated from 539.0 to 533.0 km. Hypocenter depth recalculated from 533.0 to 534.0 km.